When you’re searching for Mobile Windshield Replacement near me in Chandler, Tempe, Mesa, Gilbert, or Phoenix, we can help! We come to your office, home, or to the side of the road to help get you going again in safety! We understand that no one schedules a giant crack that obstructs their view and makes it dangerous to drive and our mobile repair makes it quick and easy to get back on the road. Even when your view isn’t obstructed having mobile windshield replacement saves you time and can be done at your office while you work or even at your home so you don’t lose time with your family. 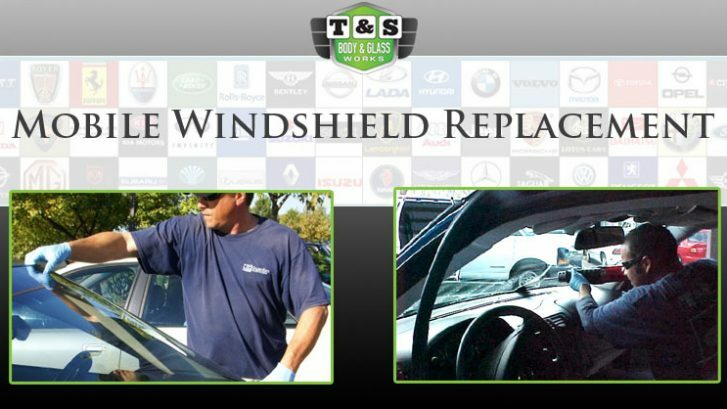 T&S Auto Glass’ mobile windshield replacement makes getting back on the road safely as quick and easy as a phone call. Our caring and professional team will help you file your repairs with your insurance company and with comprehensive coverage there is a great chance you will have to pay little to nothing for the replacement of your windshield. Every member of our staff is focused on complete customer satisfaction and we provide consistently friendly, prompt, and professional windshield repairs at both our shop and any mobile repair. We provide windshield replacement to Tempe and the surrounding cities and also take care of repairs at our shop located in Tempe. Don’t delay the replacement of your windshield and risk your safety, we are ready to help get you back on the road quickly and most importantly, safely. Mobile windshield replacement is done in various conditions and requires a little more attention to detail and our technicians are ready for the task. As the replacements are being performed care is taken to ensure that there isn’t any dust, sand, or debris that might spoil the seal by getting into the adhesive that holds your windshield in place. This helps avoid repairs that are of poor quality or worse, leaks when it rains. We know that customers don’t like waiting, and we strive to keep our appointments and arrive on time. We respect your time and want to keep you on schedule, or return you to it as quickly as we can. Our mobile windshield replacement service is designed to be quick, high quality, and get you back to your life. There is a short period of time that care should be taken while the adhesives holding the windshield dries. While safety is our #1 priority customer satisfaction is our goal with each and every repair and replacement. For decades we have provided auto glass repair to the residents of Arizona and we know that being on time, friendly, professional, and providing top notch quality repairs is the recipe for total customer satisfaction. If you live or work in Chandler, Tempe, Mesa, Gilbert, Phoenix and need mobile windshield replacement or auto glass repair services, T&S Auto Glass has you covered! We provide the most detailed windshield replacement service. We’re affordable, on time, efficient, and rated highly for reviews from our valued customers. Contact us today to schedule your mobile windshield replacement or auto glass repair!